This is a park model RV designed and built like a train caboose which of course can be used as a ‘large’ tiny house on wheels. Normally park models are about 400 sq. ft. with extra loft space up top in addition. The designer of this one is a retired train engineer and veteran. Unfortunately this particular model doesn’t have a kitchen or bathroom as it’s being used for the owner’s train and caboose collectibles. Either way I thought you’d like to look at it too since I’m sure you can also see how easy it would be to finish it as a fully functioning tiny home. Help us spread the word with a Facebook “Like” and by using the social media and e-mail share buttons below. Thanks! Beautiful! And, I understand why the kitchen/bathroom was eliminated since it’s being used as a display area. Now, THAT I would have given the designer a Standing Ovation for creating!!!! Man, I was so smitten with Artemus Gordon. Artemus Gordon, Dr. McCoy, Manolito Montoya, and John Steed. Dang, only Manolito is still around. Beautiful design and finishes. It would be easy to add the needed kitchen and bath if one were to copy this look. Thanks you for sharing! This was our most fun and unique project to date. It resides here in Wisconsin. We also build traditional park models and cabins. A lot of care and detail went into this, both inside and outside. Add a kitchen and bath, and this would make fine cozy living. I really like the different types of wood paneling along with the stamped ceiling. Very, very nice. Hi Denise! I am so glad you liked our project! We really enjoyed building it for this customer. Is this caboose insulated well and wired for living in or plumed so one can make a bathroom in it or is it just a shell? Thank you for sharing it is beautiful! Hi Glema, This Caboose was insulated with R-21 in the ceiling and floor and R-15 in the walls. The owner uses it in the harsh Wisconsin winter and uses a gas stove to heat it. We only build custom models and this particular customer did not want a kitchen or bathroom. It CAN be built with those amenities. I am so glad you liked our project!! What an intriguing project. 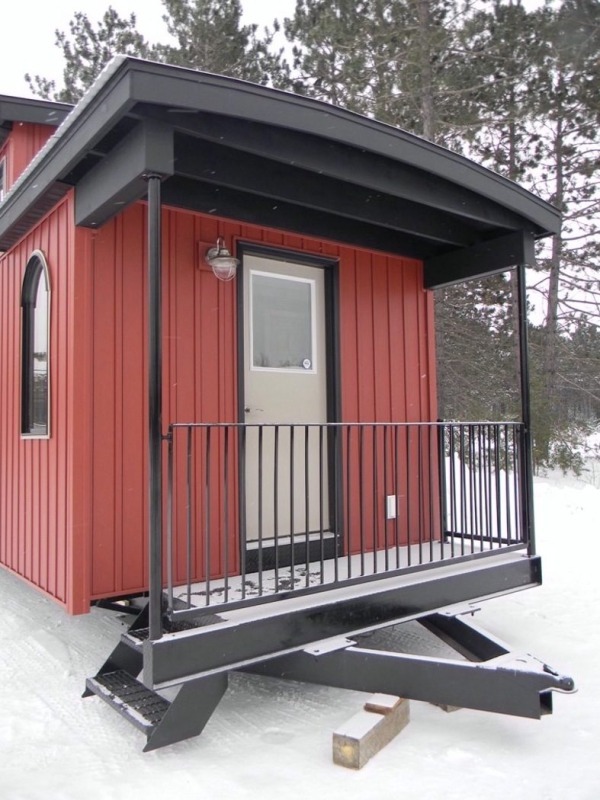 Having newly found the “Tiny House” movement the Caboose takes it up a notch! One question, what sort of dimensions were used for construction? Thanks. So cute! Would like to see more pics of the rest of this tiny caboose house.